Brad Gruno is someone who loved a good steak and never could have imagined going raw, until he did and it changed his life, his health, and his career. Three months after going raw he was forty pounds lighter and had eradicated his high cholesterol, insomnia and depression. It also put him on a whole new path and gave him a mission to share what he learned. If you've been curious about raw foods, but are a little afraid that dieting this way is too hard to do, takes too much time, or is too expensive, then this is the book for you. With a simple 3-phase strategy that shows you how to make the transition, eating this close to nature has never been easier. --Your personalized food diary, as well as Brad's answers to his most frequently asked questions about this lifestyle. Try it You'll eliminate toxins, eliminate junk food cravings, and eliminate excess pounds. How easy is that? 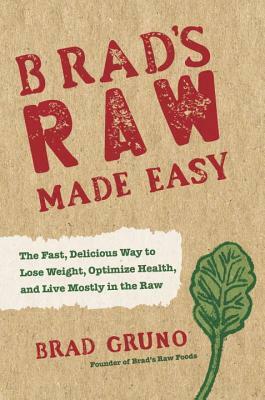 BRAD GRUNO is the founder and CEO of Brad's Raw Foods. After regaining his health through a predominantly raw diet, Brad wanted to share its benefits with others. This is how his product line was born. Brad's company is truly a business built on passion. He started it in a one-car garage, moved up to farmers markets, then his first Whole Foods store, and now it is a national brand. Brad's products, which includes raw chips and crackers, leafy kale, onion rings, raw wine and even dog treats, is sold in thousands of stores nationwide, including: Whole Foods, Wegmans, Balducci's Bristol Farms, King Soopers, Kroger, and elsewhere.